When Assistant Vice Chancellor Jim Gogan retires on January 31, 2019, after 42 years of serving UNC-Chapel Hill, he leaves a lasting legacy — a reliable, robust campus network, the goodwill he forged between Information Technology Services and groups within and beyond the University, and a gold standard for service and leadership. To honor that legacy, a new career achievement award now bears Gogan’s name, and the leader of ITS’ Communication Technologies division is the first recipient of that award. Gogan was honored at the CTC Retreat and IT Awards event on October 25 as the inaugural winner of the James P. Gogan Career Achievement Award. 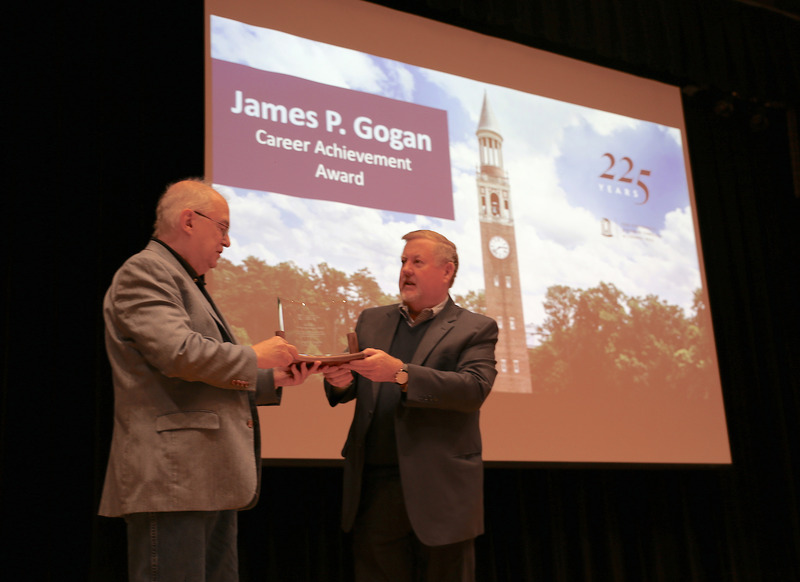 Chief Information Officer Chris Kielt presented Gogan with a curved glass plaque and expressed the campus’ appreciation for Gogan’s significant contributions to the University over the past four decades. In appreciation of long and outstanding service to the IT Community, we gratefully present this special award to James P. Gogan. Spearheading the creation of this new award was David Perrin, co-chair of the 2018 IT Awards and Linux Systems Specialist with the Carolina Population Center, with help from Tim Van Acker, Deputy Director of the Carolina Population Center. Others within Carolina Technology Consultants (CTC), including Bil Hays, CTC Advisory Board President and IT Manager for the Department of Computer Science; Daniel Reeves, CTC liaison to the IT Awards Committee; and Kate Hash, Chief of Staff and Director of Communications at ITS, provided invaluable assistance toward establishing this award and ensuring it was a top priority. 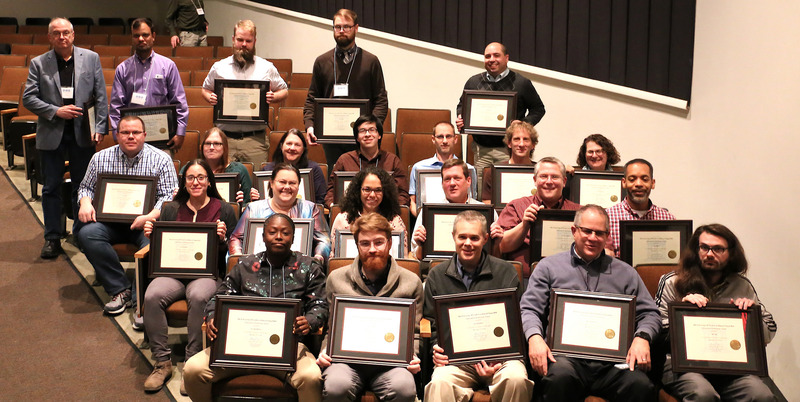 This new award will not necessarily be handed out every year — only when the IT Awards committee determines an employee is worthy for his or her years of dedication and service to the University. After the event via the CTC listserv, Gogan expressed appreciation for the recognition. “It is astounding what can be accomplished with longevity and a great team,” Gogan wrote. In addition to receiving the new career achievement award that morning of the event, Gogan received an IT Award along with other individuals and teams as part of the annual awards ceremony held in conjunction with the CTC Retreat.